AdVenture Capitalist Hacks and Cheats – Do they really give you free gold bars? 2 What is Adventure Capitalist? 3 Is it possible to hack Adventure Capitalist? 3.2 What happened afterwards? Did we receive the gold? 3.3 What about the other cheats, do any of them work at all? If you know us, then you know that we’re big fans of idle games. We’ve covered numerous idle games on our website such as Taps to Riches and Idle Heroes. Therefore it shouldn’t be surprising that we also like Adventure Capitalist. We’ve been playing ever since it was released and frequently come back to the game. However, recently we’ve had some people ask us whether it’s possible to obtain free gold bars in through the use of an Adventure Capitalist Hack. For that reason we decided to investigate. We want to answer this question and in order to do so we’re going to test all the hacks we can find for Adventure Capitalist. That way you don’t have to and will save yourself a lot of time. As always we’ll share the results of our testing with you. If we find working cheats for AdVenture Capitalist somewhere then we’ll definitely let you know where to find them. On the other hand, it’s also very possible to there are no working gold bar generators out there. If that appears to be the case we’ll share an alternative method with you. But before we get to testing, let’s talk a bit about the game itself. Adventure Capitalist is an idle mobile game available on both Android and iOS. It’s one of the most popular games in its genre and has millions of players all around the world. The game has great player reviews with an average rating of 4.6 stars on Android and 4.7 stars on iOS. It’s not often that you see a game with a rating this high, but the game really deserves it. Playing Adventure Capitalist is quite simple, after all it’s an idle game so that’s to be expected. When you start the game you have a small lemonade stand. When you tap on it you’ll be awarded money. You can use this money to buy more stands and hire managers. There are three locations in the game: Earth, Moon and Mars. Naturally, you start out on earth and when you reach a trillion dollars you have the option to expand to a new area. Once you choose to expand to a new area it will take 72 hours before it’s available, but this can be sped up by using gold. If you enjoy idle games like Tap Titans 2 then Adventure Capitalist is one that you should give a try. Is it possible to hack Adventure Capitalist? 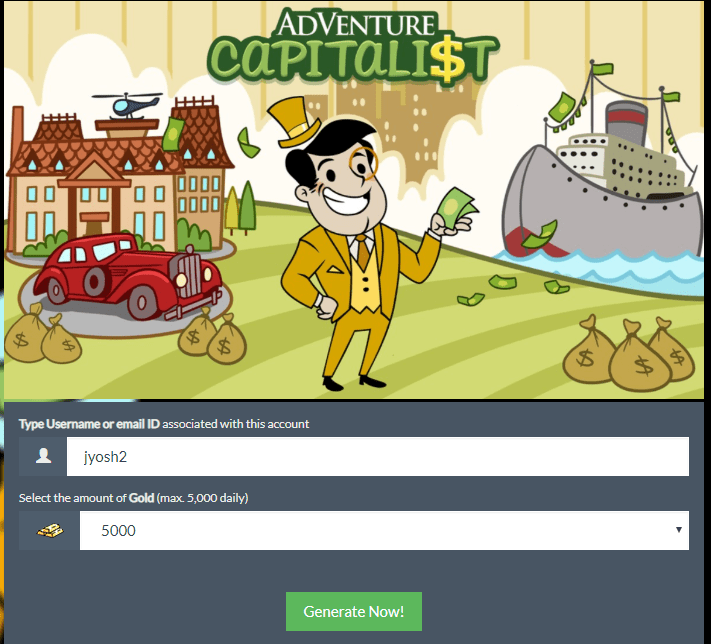 If you’ve been searching for hacks for Adventure Capitalist for a while then you know that there are tons of sites out there that claim they’ll give you unlimited gold bars at the click of a button. We were curious to see if that’s true. In order to find out if you can obtain free gold bars through the use of hacks we tested every hack that we could find. Since there are so many we’re going to show you our testing process once and afterwards we’ll discuss the results of all the other hacks we’ve tested. This is what your average hack tool for Adventure Capitalist looks like. Let’s test it out and see if it works. If you’ve ever tried to hack Adventure Capitalist then the image above might look familiar. It’s what your typical hack site looks like. Now of course they don’t all look exactly the same, but there are a lot of similarities between the different hack tools. We’re going to show you how we test the hacks that we find by using this one as an example. First we enter our username. Secondly we selected that we wanted to generate 5000 gold. Afterwards we pressed the generate now button. Once we did this a progress bar appeared and our request was apparently being processed. However, once the progress bar was finished we were not done yet. The site claimed that in order for us to receive the gold bars we had to verify that we weren’t a bot. So that’s what we did, but did we receive the gold afterwards? What happened afterwards? Did we receive the gold? The hack tool said that we would receive the gold instantly after completing their verification. However, once we booted up Adventure Capitalist half an hour after completing the verification we noticed that not a single gold bar had been added. We followed the steps as instructed on the generated to the letter and still didn’t receive anything. We therefore have to conclude that this hack tool for Adventure Capitalist is nothing more than a waste of time. It’s completely fake. However, this is not the only site with cheats for Adventure Capitalist. As we’ve said there are dozens more. Perhaps some of the other ones do really work? What about the other cheats, do any of them work at all? This question can be answered in one word: no. None of the Adventure Capitalist Cheats that we tested gave us any gold at all. All of them claimed that we would receive free gold after completing their verification but after testing them all out we ended up with a grand total of 0 gold bars. These websites try very hard to make you believe that they’ll work. They sometimes even make fake proof videos that show the hack adding the gold to the account. But don’t let them fool you, these videos can easily be faked by using After Effects. The reason why they go to such extents to make you believe that their hack works is because they obtain revenue from advertisers when you complete their human verification. However, don’t despair. We promised you an alternative method and we’ve got one. Keep reading and we’ll tell you about a legitimate method of obtaining free gold bars. Since you can’t obtain free gold bars through the use of hack tools we’re going to tell you about an alternative method. The method that we’re talking about is quite powerful. You can obtain gold for free without all that much effort. Of course, it’ll take a bit more time than just pressing a button on some generator website, but at least this method actually works. Our method does not involve some common known gameplay methods. It’s more advanced than that, but still very easy to execute. We’ve written a guide to explain our method to you properly. Our guide will show you step by step how you can obtain gold bars for free. The guide we’ve written works for both the iPhone and Android version of Adventure Capitalist so gamers on both platforms can take advantage of it. And best of all, the guide is completely free. Stop wasting your time fruitlessly trying to hack Adventure Capitalist. As we’ve shown you, they won’t give you a single gold bar. If you want to get free gold bars legitimately our guide is your best option. Click the button below to get started. Previous Post:Disney Magic Kingdoms Cheats and Hacks – Do Gem Generators really work?